Below is a non-exhaustive timeline of dicamba and dicamba-resistant soybean. I’ll add to it and update it as needed, perhaps with interesting information or current status updates. I’ve mostly put it together for my use in teaching/extension, but thought I’d post it here in case it is useful to others. 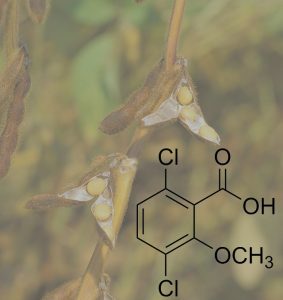 Dicamba was discovered and first described. Dicamba was first registered for use under the trade name ‘Banvel’. It was widely used over the next 30 years to control broadleaf weed species in grass crops including cereal grains, rangeland, and turfgrass under a variety of trade names and in different formulations. The first case of evolved dicamba resistance in a weed species was documented (wild mustard, in Canada). Multiple instances of kochia resistant to dicamba was soon also documented in the United States (Montana, North Dakota, Idaho, in the mid- to late-1990s). Scientists at the University of Nebraska-Lincoln filed a provisional patent application for inventions that would lead to dicamba-resistant crop technology. Other, similar patents were filed in subsequent years. University of Nebraska-Lincoln signed an exclusive licensing agreement with Monsanto Co. to develop crops tolerant to dicamba, using UNL’s technology. March, 2012 – At the Commodity Classic, Monsanto announced they plan to sell their new dicamba-resistant trait in soybean beginning in the 2014 season (this deadline was’t met). January, 2015 – Dicamba-resistant soybean and cotton was deregulated by the USDA. This decision meant that companies could now legally sell crops that have the dicamba resistant trait. Summer, 2015 – A relatively large number of acres of dicamba resistant soybean seed were sold and planted by growers. However, there were no dicamba formulations yet approved for use in these dicamba resistant crops. Widespread complaints of soybean fields injured by illegal applications of dicamba were received by states and University extension personnel. November, 2016 – The newer, lower volatility formulations of dicamba were approved by EPA. Summer, 2017 – The first full growing season where growers had access to both the dicamba resistant soybean seed AND legal formulations of dicamba to be applied to the crop. Widespread complaints of dicamba injured soybean were observed again — university extension personnel estimated damage occurred on 3.6 million acres of soybean in the US. October, 2017 – EPA, in collaboration with state regulatory agencies, placed further restrictions on the use of dicamba in an attempt to reduce off-target impacts observed during the 2017 growing season. Winter, 2017-2018 – EPA-mandated training sessions were conducted. All “applicators involved in the application of the three products registered for over-the-top use on soybean and/or cotton” were required to complete the training. Summer, 2018 – widespread complaints of non-dicamba resistant soybean being injured by dicamba were again reported. University extension personnel estimated that over 380,000 acres of soybean were damaged as of June 15, with acreage estimates likely to rise substantially as the summer progresses.